This survey gives you the opportunity to share your opinions about the efforts of our schools to promote academic success and well-being for all students. Esta encuesta le brinda la oportunidad de compartir sus opiniones sobre los esfuerzos de nuestras escuelas para promover el éxito académico y el bienestar para todos los alumnos. Wednesday, April 24th from 5-7 PM Tahquitz High School is hosting the District Job and Career Fair for community businesses to find new employees and assist job findings for junior and senior students. Please contact Kellee Shearer for more information. There is a new road closure on Stetson between Cawston and Warren due to bridge repair and the estimated closures for SR 74 and 243 up to four months. Update on closed roads and the effects on students/staff, bus schedules for Idyllwild students attending Valley schools, and areas surrounding Idyllwild K-8, Hamilton K-8, and Hamilton High School. Please see attachment for maps. 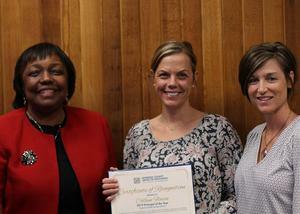 Riverside County Principal of the Year Dr. Colleen Flavin! 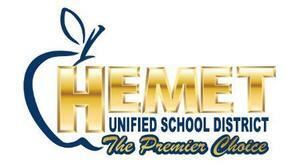 Hemet High School is hosting this year's CTE Fair on Tuesday, March 26th from 6:00 PM-8 PM. 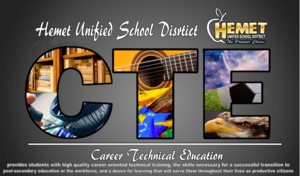 There will be door prizes, displays and demonstrations, entertainment by Hemet and West Valley High School, information about CTE programs and more! Safety Director of the Year Finalist Christopher Wynn! Campus Safety Director of the Year Finalist Christopher Wynn, our Director of District Security, is recognized for his amazing work in Hemet Unified. Check out some of his top accomplishments, as well as a photo gallery of his department.